December 29, 2015 2 comments on "Why the floods mean you should support my politics"
Indeed. With that beautiful thought in our minds, let’s proceed. As well as property, I hope the River Aire will have swept away some illusions. 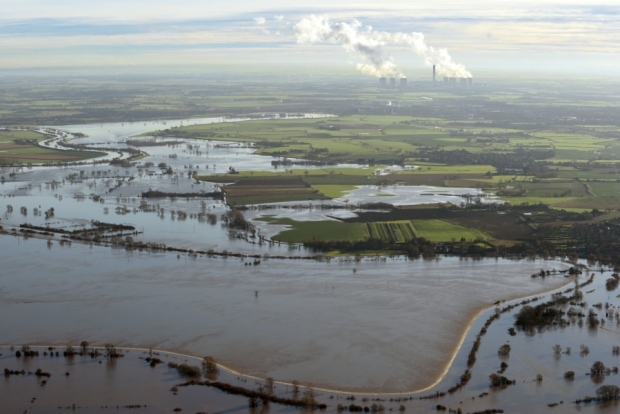 The first illusion is of course that we can just go on treating floods and water as a minor news event to be managed through the technology of public relations, this being one of the great unspoken cross-party dogmas. It’s like that enormous coal-fired power station was trying to tell us something! As long as I can remember, there has been endless official concern, reports beyond number, constant chin-stroking, but bugger all action. until it rains a bit. Then politicians appear in high-visibility jackets, as do token numbers of soldiers. Eventually the water ebbs away and so does the media interest. Now, surely, we’ve had a teachable moment: Leeds and Manchester flooded on the same day. I wouldn’t sign any cheques on that, though. The second illusion is that the devolution offer to West Yorkshire is at all useful. Very simply, it wouldn’t give Yorkshire the budget or the authority to reinstate the planned Leeds flood defence scheme. If you can’t have different policies to those selected by Whitehall, you don’t have devolution in any meaningful way. The only reason to want it is to set different priorities, and you can’t do this without a substantial capital budget. This has so far been a vague and theoretical issue. It is now as concrete as…concrete. Ask what we might have done differently, and there’s your answer. As I pointed out here, the current proposals offer the devolution of responsibility without the devolution of power. Don’t kid yourself that we wouldn’t now be seeing the prime minister touring the North with George Osborne, blaming the disaster on one-party Labour councils and their crazy overspending. This leads me to the third illusion. The third illusion is that the devolution offer is right in terms of geography and of politics. The water didn’t come from Leeds and is not going to end up in Leeds, nor did it come from a Leeds City Region. Water does not care about trying to cut this or that party’s voters in or out. Instead, it defines the landscape that later defines us, in its own way. Yorkshire’s historical boundaries to the North and South are rivers. To the west, the boundary is roughly the watershed, and to the east it is of course the sea. Within this space, water flows from the moors down through the steep, narrow southern Dales, creating the heads of water that powered early industry and that filled the canals of later industry, through the cities, and down the Ouse across its floodplain, the Vale of York, to the sea. Yorkshire is roughly the River Ouse catchment area, give or take the upper Ribble. It follows that you can’t solve a Yorkshire-wide problem in Leeds, and indeed that’s why we had a Yorkshire water authority and now have a privatised Yorkshire water company. This really ought to be obvious from that alone. But, aren’t the Yorkshire-wide proposals rather weak? Perhaps. We have some relevant experience here, though. This was a criticism of the Welsh and Scottish assemblies and of the Greater London Authority when they were created. It was also a criticism of the Northern Irish assembly when it was created. All the devolved authorities have gained in power and authority with time. The mayor of London started out without even having any authority over the Tube, but has progressively taken over more and more power, and has even gained a veto over the commissioner of the Met. None of them has ever handed powers back to the central government. This is, I think, because they are comprehensible, they cover the essential geography, they are elected, and they started with significant powers. The mayor of London is mayor, of London, and his area of responsibility matches very well what is commonly called London. You can always niggle about boundaries, which are inevitably imperfect, but there is nothing grossly silly about the GLA’s. Similarly, the Scottish, Welsh, and Northern Irish authorities do what it says on the tin. No city regions there. These authorities also draw legitimacy from the fact they are elected. In a sense, each election is not just a choice of parties or individuals, it is also a referendum on the institution’s existence. Therefore, with each electoral cycle, the devolved authorities have become stronger, more legitimate, and better established. To get the ball rolling, though, they needed to have a minimum of substance, enough to make a palpable difference. For London, it was enough to give Ken Livingstone the buses and the congestion charge. We can compare the various regional entities – partnerships, assemblies, government offices – which have never lasted. Without comprehensible identity, democratic legitimacy, or significant powers, they have just been afterthoughts. You might say that a city region solution could progressively take over more territory, in the same way that a Yorkshire-wide one could take on more powers. But there is no precedent for this, and it could as well lose it as gain it. The central government frequently chops up local government boundaries. But as I say, all the other devolved governments have only ever gained more powers, while local governments have as often lost territory as gained it. Please, I ask you as fellow human beings, vote for the political party which I support, and ask your legislators to support policies endorsed by me, as a matter of urgency. 2 Comments on "Why the floods mean you should support my politics"
I’m not holding my breath, but one might hope that e.g. Ilkley might reconsider it’s iron-clad support for the Tory party after being cut off by heavy flooding.